This edition includes a supplement, sold separately. 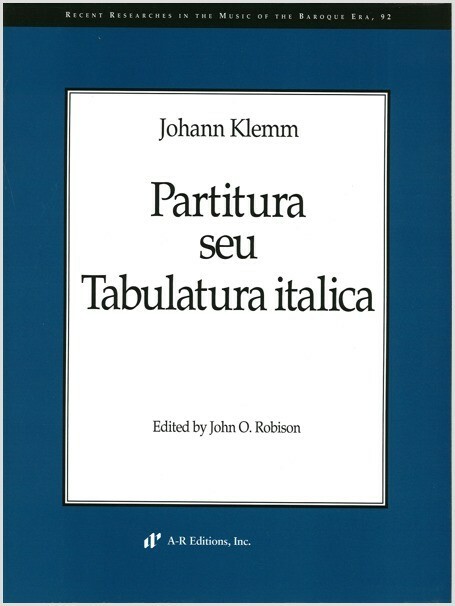 Published in Dresden in 1631, the Partitura seu tabulatura italica is one of the most rewarding sources for the study of the early seventeenth-century fugue. Johann Klemm was a court organist in the Dresden musical establishment, and one of Schütz's colleagues. The Partitura has a two-, three-, and four-part fugue in each of the twelve modes, totalling thirty-six compositions. In these fugues, Klemm demonstrates numerous ways of restating and varying a fugue subject during the course of the composition. This edition of Klemm's fugues preserves the open-score format of the original print; a keyboard score version of the three- and four-part fugues is available as a supplement. Klemm indicates that his fugues are intended for performance by instrumental ensembles as well as by keyboard players. They are highly recommended not only for organists, but for viol consorts, violin bands, recorders, and ensembles of cornettos/sackbuts.